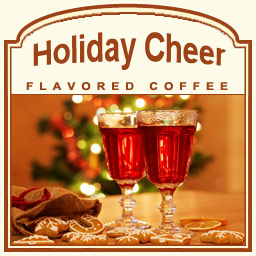 Holiday Cheer captures the spirit of the holiday season in each and every sip of this delicious flavored coffee treat. With creamy French caramel, soft and sweet vanilla, toasted and crunchy almonds, and a hint of Jamaican Rum, this 100% authentic Arabica bean gourmet flavored coffee will hit the spot with this exceptional blend of flavors. Sweetly warm and cheery, this Holiday Cheer flavored coffee is perfect for those that want to celebrate their favorite holidays year-round. With only 2 calories in each cup, this Holiday Cheer coffee will make indulging in this luxurious coffee guilt-free. Roasted and shipped on the same day, you will have your Holiday Cheer packaged in a heat-sealed valve bag to ensure optimal sweetness and freshness. Whether it's the middle of spring or the beginning of December, give in to the holiday temptation with this Holiday Cheer flavored coffee treat!